As with any social network, a first impression is important, especially if you’re using the social network as a marketing tool. Don’t create your profile page without some sincere thought toward the impression you want to make on your potential customers. 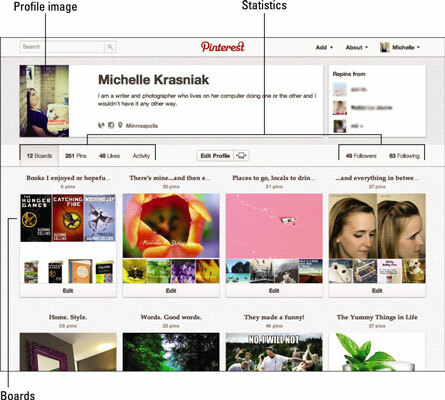 Your Pinterest profile page is where pinners stop by to find out more about you. To get to this page, click your username in the top-right corner. The profile page contains your profile image, a few words about you, and displays your boards. You can also add your website address (if you have one) and your Facebook profile page. Profile image: This is the image you want to display that best represents your brand. Most brands use their logo or a photo of your product. Repins From: This box lists the most recent people to share your content. Statistics: You can see your total pins, likes, repins, and boards, as well as how many people you’re following and how many are following you. Boards: All your boards are displayed. Now it’s time to make sure your profile gives a positive impression to your Pinterest community as well as any potential community members or customers by filling out your profile information. Start with the general information first. Hover your mouse pointer on your name in the top-right corner of the page and choose Settings from the drop-down menu. You arrive on the Edit Profile page. The e-mail address you used to sign up for the account is automatically entered in the Email text box. If you need to change your e-mail address, simply click in the Email text box and enter the new e-mail address. Don’t worry; your e-mail address is not displayed publicly. Below the Email text box are several more options. For now, skip down to the Username text box. In the Username text box, enter the name you want to use for this account. You can use your own name or the name of your brand. It has to be between 3 and 15 characters long. If the name is already in use, you see a The username is already in use message appear written in red on the right side of the box. If your desired name is not in use, the message says Available in green. Select gender if you want, or leave the option unspecified if you’d rather not. In the About text box, add your bio or a few words about your business or brand. This is probably one of the most important parts of your Pinterest account (aside from what you pin, of course). Here’s your chance to tell other pinners about you and/or your brand. When they click on your Pinterest page, this information appears right at the top of the screen, so make sure to put your best foot forward! In the Location text box, enter your city and state. This is optional, but it’s important to include this info if you have a physical location you want to drive people to. Add your website or blog URL in the website text box. Again, this is optional, but why would you be getting your brand involved with social networking if you didn’t want to give out your website or blog address? Below the website text box is an Image option. Determine whether you want to add your pins to your Facebook Timeline or link to Twitter. 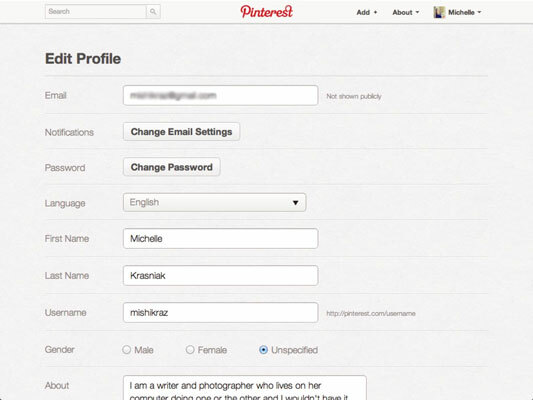 Either select or deselect the Hide check box, which hides your Pinterest profile from search engines. As a marketing tool, it wouldn’t make sense for you to hide your pins from the search engine. After all, the more people who land on your pins and click your links, the better. All those backlinks to your home pages couldn’t hurt, either. Sometimes when people are creating a new board they like to hide the pins until the board is complete. There are no hard and fast rules. Click the Save Profile button at the bottom of the screen.